Select Home in the left pane to get a personalized and up-to-date overview of what you and people around you are currently working on. Your Home page shows documents that are stored in OneDrive for Business or SharePoint, and are likely to be most interesting to you right now. 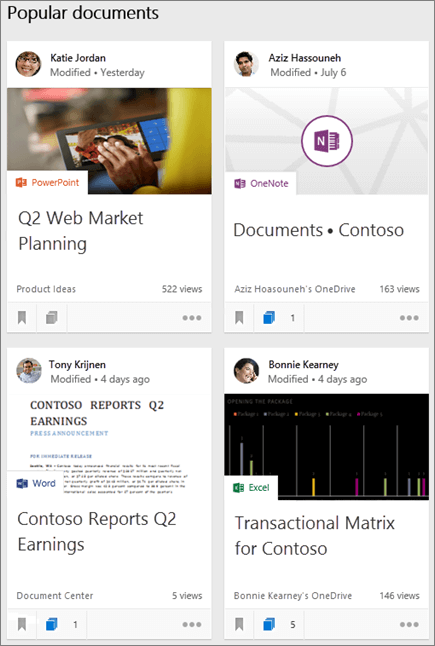 These may include Office documents, PDF files, SharePoint site content, images, and more. The Home page may also display Office documents and PDFs that have recently been shared with you in emails, videos that have been uploaded to the Office 365 Video portal, and webpage links from Yammer. For more information, see How does Delve know what's relevant to me? When you visit someone else’s profile page, you see information about them and what documents they're working on. You also see people they're connected to, and a selection of popular documents from people around them. You'll see only documents that you already have access to, not someone's private documents, or documents that haven't been shared with you. Start typing in the search box at the top of the left pane to find people, documents, or boards. Select a person's name or picture anywhere in Delve to go to his or her profile page. 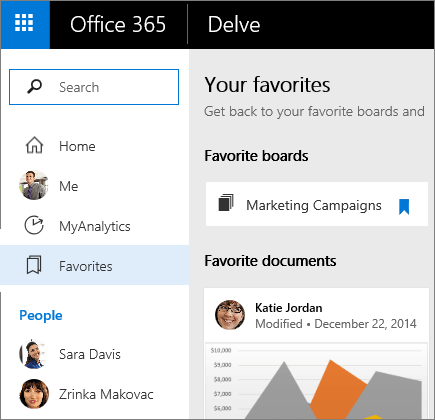 Contact someone through email, phone, or Skype, directly from their Delve profile. To make it easier to know when to reach out, Delve gives you a peek into what someone's day looks like by showing the free/busy information from their calendar. And if someone's not in, Delve shows their out-of-office message. Note: Calendar availability and out-of-office messages (automatic replies) on Delve profiles are currently available only if your organization has opted in to the First release program. 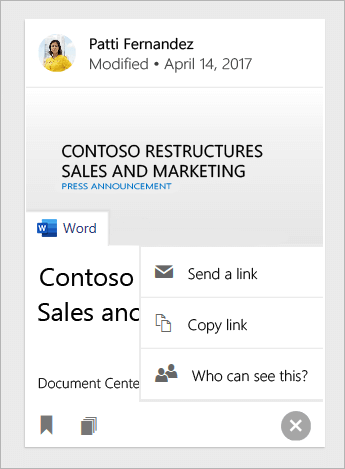 The recent documents section shows documents that are stored in OneDrive for Business or SharePoint and have recently been created or modified. Select See all to display more documents. Select Filter by file type and then a file type in the upper-right corner to limit the documents you see. Select Add to favorites in the lower-left corner of a document card to add the document to your Favorites. Select Favorites in the left pane to get back to your favorite documents. Only you can see what documents you've added to your Favorites. Select More options in the lower-right corner of the content card. Select Who can see this? On the Share pane, select Grant Access. Type the names or email addresses of the people you want to share the document with. Enter a message to send with the invitation, if you want. 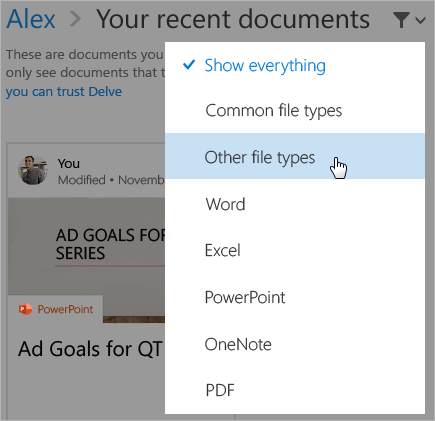 For more information about storing and sharing documents, see Store your documents where Delve can get to them.